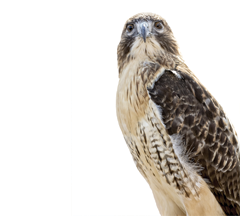 A raptor of the open country of the West, the Ferruginous Hawk is the largest American hawk. Adult Ferruginous Hawks have white or light gray tails. While some have mostly white heads, with rufous back and shoulders, others are dark brown with light gray or whitish tail. Both are lighter at the ends of their wings. Their undersides are mostly white, with rufous legs, making a dark V visible from below. Ferruginous Hawks have feathers on their legs all the way to their toes. Juveniles are similar to adults, but have lightly banded tails; light form lacks rufous legs and back. Ferruginous Hawks nest in trees with clutch sizes ranging between one to eight eggs. It hunts by watching for prey while it soars high above with its broad wings and shallow V, swooping down to catch its prey which include ground squirrels, young jackrabbits, snakes, and other good-sized prey. Open country, primarily prairies, plain and badlands, breeding in trees near streams or on steep slopes, sometimes on mounds in open desert. Before the elimination of bison in the West, nests of the Ferruginous Hawk were often partially constructed of bison bones and wool.